I don’t like to make promises I can’t keep, and last week I promised myself that I’m going to eat pesto every day for the rest of my life. So far, I’ve made good on that promise. The only thing that might thwart me is a lack of big, copious bunches of fresh basil, which are a bit of a rarity in Paris. (Most of the great basil is found in the south, in Provence.) Or my pounding arm wears out. No taking bets out there on whichever comes first, but I have a pretty good idea which it’s going to be. The word “pesto” is a derivation of the Italian word for “pounded” so it should be made in a mortar and pestle to be true pesto, although some prefer a blender or food processor. I used to be pretty dictatorial about using a mortar and pestle, but when making it for a crowd, as I sometimes do, I rely on my food processor to do the trick. A blender will work, too. Classic pesto is made with pine nuts in it, or sometimes walnuts. But the French version, pistou, usually leaves them out, so I sometimes make it without. Pesto made with nuts has more “clinging power” to it and hangs on to pasta better. Pine nuts have gotten expensive but if you decide to use them, it’s worth shelling out the money for ones from Spain or Italy. If you want to be totally luxurious, shelled pistachio nuts are another way to go. But walnuts are fine, and are a less-expensive, but delicious, option. 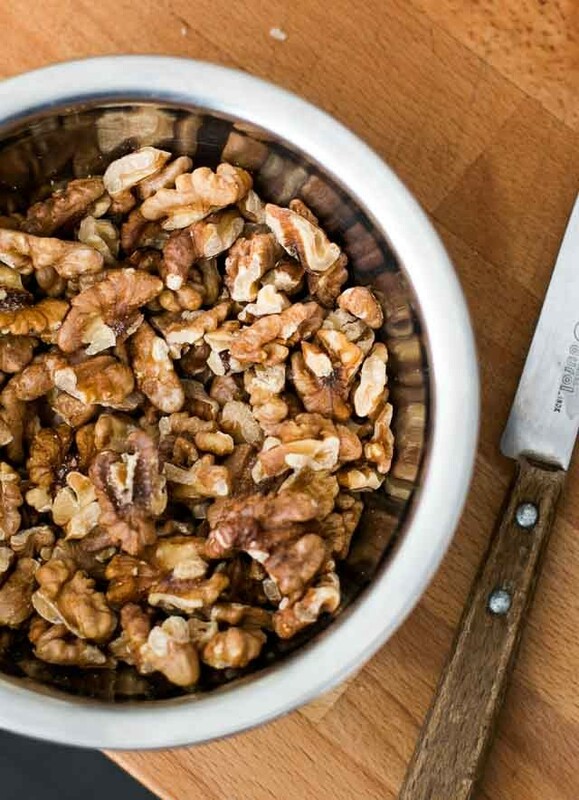 Be sure toast whatever nuts you use lightly before grinding to bring out their nutty flavor. Although people think of pesto as going with pasta, roasted or boiled fingerling potatoes can be tossed in pesto for quick potato side dish. Pesto can be spooned over a platter of sliced tomatoes and avocados with crisp bacon chunks, stirred into a bowl of sautéed corn kernels, or tossed in pasta with green beans and fresh cherry tomatoes cut in half. The best way to toss pasta in pesto is to drain the pasta, reserving a bit of the pasta water. Return the noodles to the pan and toss with pesto, adding a bit of the starch-rich pasta water if you want to thin it out a bit. I make sure there is a bowl of grated Parmesan cheese on the table for guests to add to their pasta, as they wish. Be sure to rinse and dry the basil leaves well. I give mine a shake outside my kitchen window. I haven’t lost a leaf yet. (Although some of the people down below on the sidewalk might wonder where that basil-scented mist is coming from.) Those of you who prefer to live less vicariously can use a salad spinner or shake them in a tea towel.If using a food processor or blender, or similar device, I recommend grinding up the nuts, garlic and cheese first, then adding the remaining ingredients and pureeing them until smooth. No need to pre-chop the basil leaves – just add them right in, and stop the food processor a few times to scrape down the sides as you go. 2. Coarsely chop the basil leaves, then add them to the mortar and pounding them into the garlic as you add them. 3. Once well-mashed, when they’ve become a fairly smooth paste, pound in the olive oil, adding it a spoonful at a time, until well-incorporated. 4. Lastly, pound in the cheese, then the pine nuts. 5. Continue mashing everything for a few minutes until the pesto is as smooth as possible. Fresh pesto should be served within a day or two after it’s made. Otherwise the garlic can become overpowering. It can also be frozen for a few months, if well-wrapped. Note: Curiously, although I don’t think it’s so traditional, I used to eat at a pasta restaurant in San Francisco that made the best pesto pasta. It was simply prepared and delicious; just a hot pasta tossed with lots of pesto. It wasn’t until I ate their alone and sat at the counter, which had a view of the kitchen, and I saw the cooks adding almost a full stick of butter to each pasta as they swirled it in the pan with the pesto! I don’t think you need to eat a stick of butter with your pasta, but at the risk of upsetting traditionalists, a small pat of butter does round out the taste of the pasta pretty well. And I’ve know good cooks to sneak in some Emmental cheese along with the Parmesan. Next best thing — a Mexican lava rock molcajete. I bought one in the market in Guadalajara and my husband carried it (close to 50 lbs, probably) through three plane changes back to Boston. It is my prized possession and happily grinds anything I put in it. Love pesto, but my basil isn’t quite large enough to use enough for a decent size batch. I have purple basil too, but I think a purple pesto would creep people out. I actually have a recipe for a mint pesto I’m going to try, since I have a ton of it growing already (it grows like a weed! always plant it in containers!). I always add a pinch of Vitamin C powder to my pesto to keep it from turning black. If you’re careful with the amount, it does the trick without affecting the flavor. Basil is the one herb I absolutely MUST have in my garden to ensure an ample supply to make pesto throughout the summer. Tomatoes and other ‘standard’ home garden vegetables are cheap and plentiful here in Italy, so I don’t even bother with them anymore, just plenty of basil (along with a few other herbs). Right now I have several plants in pots near the door for quick additions, and maybe 10 or 12 plants in the orto. My Italian mother-in-law, Tina, put a tbs of butter with most of her sauces, both pesto and tomato. It helps in the clinging power and does also give a little flavor too. Also some people like to do a 50/50 Pecorino Romano and Parmesan blend, I find the Pecorino Romano too salty for my tastes and also prefer just Parmesan. I was just going to pick some sage to make a sage pesto my friend taught me here (a local chef) which he usually makes in winter, when basil is not available. Sage, walnuts and lemon zest! There is such a difference between store bought and home made pesto that I have vowed to only eat what I’ve made. Such richness of flavor. I’m always buying whole basil plants which always seem to die after one week but at least I have enough basil for a big batch of pesto. I’m just wondering: other than the nuts, what is the difference between pesto and pistou? I hear so many different things, like using sundried tomatoes in pistou, or just using basil and olive oil…What are the traditional variations of pistou? THANKS! Linda: I agree. Once you’ve tasted the real thing, the stuff in the jar is so wildly-different and bland, it’s not really worth it. In Nice, the pasta shops sold excellent pesto (pistou), which were fresh and had that amazing fullness of real basil. But from now on, I’m resigned to making my own—until the fresh basil runs out! Kerry: Pistou is the French version of pesto. And as you mentioned, the main difference is that pistou doesn’t usually have nuts in it. Although there’s lots of exceptions and variations. I have a pistou recipe that calls for fresh tomato pulp pounded in, from Marseille (and Julia Child has a similar recipe), although from what I’ve seen, and tasted, that’s more of an exception than a rule. And as you can see from Judy’s comment, above, Italians often make pesto with sage (and other herbs and greens) as well. Thanks for that–I’ve always wondered and never found the answer. As for other herbs, my favorite thing to do is mix mint pistou with baguette crumbs to form a paste, and then pack it onto a rack of lamb and roast. Everyone should try it, it’s so good! Can I send my husband to you for a while? He’s a pesto freak and I have to be honest I can only have it so many times before I need a break! Personally, I’m looking forward to making purple pesto! I’m growing my purple basil just for that purpose. I have two little boys who love the stuff and will get a kick out of the color. We’ll see if it looks gray or purple at the final production. Gray, not so appetizing. I crumble bulgarian cheese or feta on oil-coated pasta whenever I don’t have a sauce on hand, so I’m with you on that! I’m lucky enough to live near an Asian market that sells huge bunches of thai basil for 79 cents, so I’ll definitely be using my (unused) mortar and pestle instead of the food processor next time. Thanks for the ideas. Have you tried using some Thai Basil instead? Or just using a portion of it with Thai Basil? Does it taste different? I know it’s not traditional, but we often make our pesto with parsley in seasons when fresh basil is hard to come by. (We got this idea decades ago in Frances Moore Lappé’s book Diet for a Small Planet.) We really like it, but perhaps that’s partly because my husband so often makes fresh pasta to go with it, and fresh pasta would make anything taste better! Oh, man, this is why I love summer. 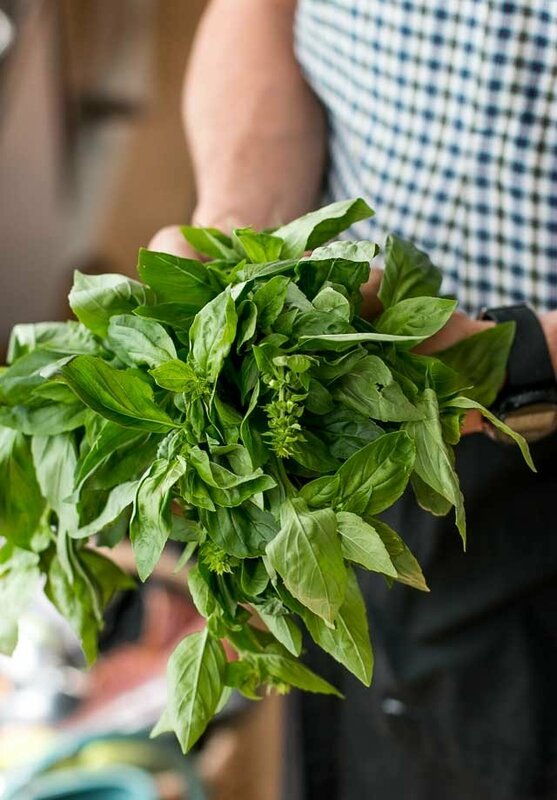 There’s nothing better than the smell of fresh basil. p.s. I wish all the dripping air conditioners in NYC could emit basil mist instead. I love pesto with parsley! Once I was making a pesto pasta salad (the secret to serving it cold is mayonnaise) and realized I only had about half the basil I needed. A rummage through the vegetable bin yielded chives and parsley. It all went in and got rave reviews. I like to leave the pine nuts whole, for flavor and texture contrast. Now I’m hungry for pesto! I have a ton of basil that’s been growing like crazy outside my kitchen window, so I’ve been meaning to make a big batch of pesto. But I have to admit, I’ve always used the food processor instead of the mortar and pestle. Do you really think there is some advantage texture-wise to pounding it, or is it just a matter of being authentic to the name? Either way, thanks for the ideas for ways to use it up other than on pasta! instead I use fresh coriander to make a really refreshing pesto. coriander, macadamia nuts, garlic, extra virgin olive oil, fluer de sel and lemon juice. It’s delicious with pasta and lightly boiled shrimp. and works great with everything else. I freeze it so I can make a big batch at a time. the colour and taste don’t change. It tastes good over soba noodles also. I didn’t see an email address for you (you’d probably get swamped, no?) but I still feel it’s important to let you know, off-topic though it may be, that on Sunday I made the most fabulous ice cream I think I’d had in my entire life. I warmed and soaked some very nice coffee beans in milk, cream, and sugar per your recipe. I tempered the eggs (without making scrambled-egg ice cream… a fear I had starting out) and cooked and strained and whisked. I hand-pounded a few beans into powder to mix in at the end. I waited, holding my breath, as the machine churned and churned. So. Freaking. Good. It was flawlessly creamy and smooth and cold and good. Great recipe. (And I must say myself, great implementation.) This was the first time I was able to use one of your recipes and the wait was well worth it. Enjoy your pesto! As for preservation of your pounding-arm… you just need to invite the proper guests to dine with you. I would gladly pound all day long to share in the meal — and I’m sure I’m not the only one. Sara: You want to send me your husband?? Does he have a say in that? Mary: We-e-e-ell, since I don’t have a food processor, I can’t do a side-by-side comparison, but I think chopped in a processor isn’t the worse thing in the world. There is likely a difference, but pretty slight. Some say the pounding releases certain flavors in the basil, but it sounds like a bunch of hooey to me. Still, I like to use my mortar & pestle because it makes a nice paste and it’s kinda fun—and I think the noise scares my neighbors downstairs. This sounds delicious, I think I have to make some pesto. Out of curiosity, what is the restaurant in SF? As much as I want to try to make pesto, I might have to cheat and just go out and eat what someone else has prepared. Does Paris have Asian markets? Here in Denver, that’s where I always find big bunches of basil cheap, since it’s a staple with pho. If you’re planting it, the Greek columnar variety is best, I’ve found, since it doesn’t bolt. (that gelato, btw, was the single best ice cream I have ever had. Period. Bar none. Absolutely incredible). 20g is the total of the 5 cups? i’ve been making my own pesto(sometimes with cashew!) for a few years now and i’ve usually just eyeballed it. i get confused with recipes asking for packed or loosely packed… or i’m just OC – so, i’ve never really had an actual recipe written down for it. btw, for how long can we safely store pesto? i’ve heard of botulism in storing fresh garlic in oil. or will lemon help keep bacteria at bay? i’ve yet to freeze pesto – i agree, i’m concerned that freezing will “cook” the leaves. I’m surprised that nobody mentioned making pesto from rugala. it grows like a weed here on my island and if you don’t keep picking it it flowers and bolts – as well as salads and soups – we make a lot of pesto out of it. 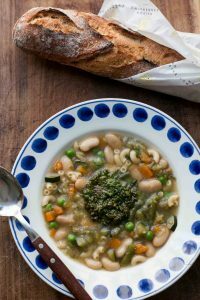 After the first time I ever tasted pesto, I found myself getting up in the middle of the night with a serious enough craving to climb down 3 flights of stairs in the dark to the kitchen on the ground floor! The housemate coming home late, who walked in on me standing in the light of the open fridge in my pajamas, with my spoon in ‘his’ jar, was flattered beyond belief and also laughed so hard. He had made an enormous 2 quart bucket to give as a birthday gift to a friend of his and let me taste it earlier that afternoon. I had just never had anything sooo delicious. I just made a half basil, half mint pesto the other day. So good. I add blanched asparagus to basil when I make pesto, and a few tablespoons of chicken stock. I’ve tried a sage pesto and I found the taste too over powering for me. Basil is definitely the way to go. I wonder how a little sage to a basil pesto would taste? Hmmmm. Good luck on your quest, David. I always used to think that making pesto in a mortar and pestle was just for purists who were willing to spend hours pounding. But then I tried it, and I found out how much EASIER it is than using the blender or food processor. When I use the blender, I pulse it for half a second, spend five minutes scraping the sides and the blades, pulse for half a second, scrape for five minutes, ad nauseam. With the mortar, there are no blades or crevices for the leaves to get stuck in. And it’s a heck of a lot easier to get the finished pesto out of a smooth bowl. I agree with what others have said – store-bought pesto is lousy. Six bucks, and you get half a cup of wilted basil, canola oil, rancid pine nuts (if you’re lucky) and cheap Kraft “parmesan” cheese. It’s like expecting filet mignon and getting a McDonald’s burger instead. but really, i just clipped a huge bunch of basil from the garden and i can’t wait to make fresh pesto. and i certainly can’t wait to see how your promise works out! one of the best ways I love pesto is swirled into a potful of cheese fondue. I started doing it years ago, and now I can’t stop, as it is truly delicious. I make large batches of pesto every year at the end of the summer when I can buy big bunches of it from farm stands. I freeze it in small containers to enjoy as often as I can, throughout the year. It is green gold! and I must say, I just bought the Perfect Scoop the other day, and made two batches yesterday! One was the Aztec “hot chocolate” one, and the other was the Cinnamon. Amazingly good, smooth and creamy. And fabulous when scooped together. There are so many flavors I want to make, that my ice cream machine will be getting a workout, which makes my kids happy too! Why restrict yourself to just basil for pesto? Heck, I’ll turn any leafy herb into pesto if you let me. Parsley, cilantro, mint, sage, oregano, pretty much anything I can get a bunch of, I’ll do. You should try this, too. Basil pesto can be overrated sometimes. Love your website. I too, think I could eat pesto every day. I always plant at least a dozen basil plants and just made my first batch of the summer. Often I make batches without the nuts and cheese and freeze them in small jars for the winter. Then I add the nuts and cheese later if wanted. I also make my own “house” dressing with pesto; basic vinaigrette with white wine vinegar, olive oil, shallots and and couple of tablespoons of pesto. It’s the best salad dressing ever and another way to get your daily dose of pesto! Thanks for reminding me to go outside and pick some basil from the garden. I’ve made pesto inspired by Marcella Hazan’s recipe for years – she finishes the pasta with a little butter. Trenette col pesto–a Ligurian specialty containing pasta, pesto, diced cooked potatoes and sometimes small green beans is simply wonderful. It’s even better than the sum of its’ parts. This looks divine! I LOVE homemade pesto! Unfortunately, for all those who intend to use purple basil for their pesto, it turns a nasty shade of black when it is ground up. The flavor is fine, but it’s rather unappetizing looking. Best off leaving it fresh where it can look the beautiful color that it is. I also use arugula early in the season when the basil hasn’t totally filled out yet (about a half and half mix). The taste is quite different, with the bitterness of the arugula, but I absolutely love it. don’t know if it’s possible to you to find this fantastic sheep cheese. but try! Hi David! Delurking because I had to tell you I made your vanilla ice cream from Perfect Scoop last night and it was aaaabsolutely the best. My first custard attempt, and I went very slowly to avoid scrambling the eggs, but it’s so delicious. Also made meringues last night with the leftover whites, they went quite well with the ice cream! Every summer (I grow my own basil) I make pesto at least twice a week. Both my husband and my son love this simple sauce. I make it exactly like how you make your pesto. Here in central Illinois we must grow our own basil. My friend has a small greenhouse to overwinter his tender plants. It is too hot to use for much in the summer, except basil. He grows about a dozen plants in 16 inch clay pots and brings me bushel baskets full to make into batches of pesto for friends and for the freezer. We used to make repeat cuttings from the same plants, but we noticed that each regrowth was progressively more sharp and less sweet. Now we replant after each harvest and get about four harvests in. The biggest advantage to our super cheap system is that we don’t need to wash the basil since it was never exposed to pets or pesticides. I get the mortor vs processor thing. It is an ancient act that feels good, like kneading bread. But, I think our food processor pesto is pretty damn good for Kankakee. BTW I use a Sartori Reserve Bella Vitano blended parm, fontina and romano, made in Wisconsin for my pesto. Yow, so many other pesto-lovers out there! Just to keep you up-to-date: I made good on my promise, so far, and last night was pesto with gnocchi and green beans! David, be careful. I also once decided that I would eat pesto every day for the rest of my life. And I almost ruined it for myself! That is, after a whole summer of eating pesto frequently, I got sick of it! It took a season or two before I began to look forward to it once again. Shira- I’m so disappointed with your news about purple basil. My kids and I will try it once purely for the science of it. I’ll put out primarily sweet basil next year. I often freeze “basil cubes” in ice trays. I puree basil with olive oil and save them all winter for use in soups, etc. Not as good as fresh, but a heluva lot better than dried and much cheaper than fresh off season at the market. I know I could eat pesto every day for the rest of my life. I plant two packages of basil seeds every year in my vegetable garden (along with my 20 heirloom tomatoes). Nothing gets better than that! Try it with cilantro, spinach, walnuts, and some fresh lime juice-skip the garlic, because garlic will just overwhelm it. I get my pesto from the market in a small town in the Vosges–seems like a strange place to get it from, but it’s truly the most delicious I’ve ever had. At lunch today I made myself a sauteed zucchini + fresh tomato + tofu salad and didn’t know what to add, so I added pesto. It brought the whole thing together and ended up being fantastic. Pesto is so versatile, everyone should be having it everyday! Say, is that restaurant in San Francisco still open? Mind giving us the name? Sounds Yum ! Great post, I’m really inspired. I make pesto with garlic scapes. Oh my….. it’s lovely. I could eat pesto every day as well…and it’s good for you, right? Homemade is also SO much better than the jarred variety. But you’re a stronger homme than I am a femme, I couldn’t do that mortar and pestle thing, I am a wimpy cuisinart owner!! We have a version of pesto in Latin America. It’s called chimichurri. We put it on meats and on sausages and it is mostly used on grilled foods and sometimes vegetables. I keep a pot of it in my refrigerator and it lasts me forever. I use it to marinate and/or afterwards to complement something that has been cooked (I let it warm to room temperature when I use it). When I start running out I make more. Parsley (about 90%) oregano (dried), salt, garlic and olive oil. That’s it. Oh! and the food processor. Absolute necessity when making chimichurri. Can’t be done in a mocajete as properly as pesto apparently can and that first lady whose husband carried it for her from Mexico… wow… talk about fabulous husbands. I know how heavy they are from first hand experience with bringing over my own. Wish I’d had a husband like hers then. 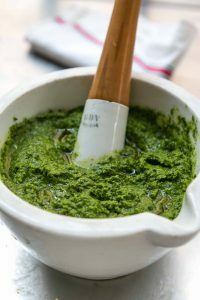 I am very curious to see the many ways you will be eating pesto – everyday for the rest of your life! I wonder will there be pesto ice cream? Pesto pancakes? 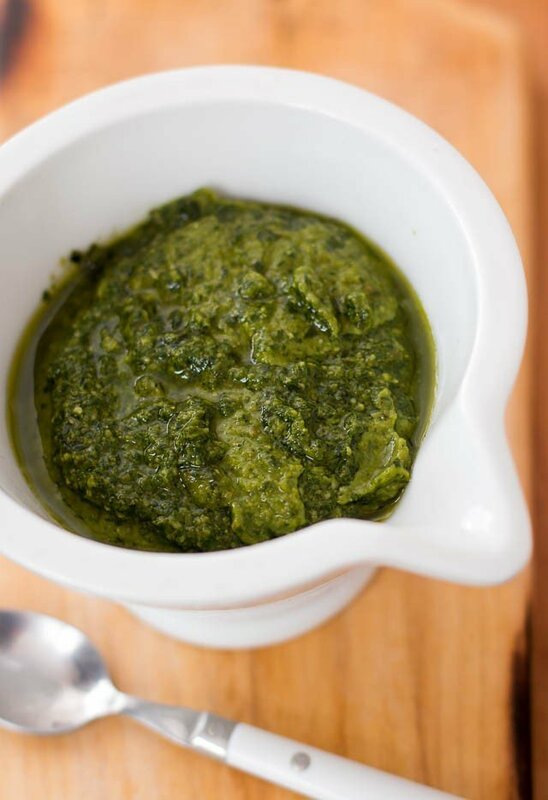 I love pesto so much sometimes it is not even a condiment – I just eat it straight. You don’t own a food processor, eh? Wow. Great ideas for what to do with pesto besides pasta. And I’m going to guess the restaurant was Pasta Pomodoro. Milena: That chimchurri sounds great, and I’ll probably start eating that in the fall, when the basil runs out. Jill and Shira: Susan over at Farm Girl Fare made purple pesto and it’s not that weird-looking, although I’m still firmly in the green pesto camp. Steve: Busted! Actually pasta is the ideal, and lends itself well, to being ‘fast food’ so I don’t feel too guilty. Anyone ever blanch the basil before blending it? It takes a bit more work but has always worked great for me. Especially when the basil is a bit too bitter, ten seconds does the tick. 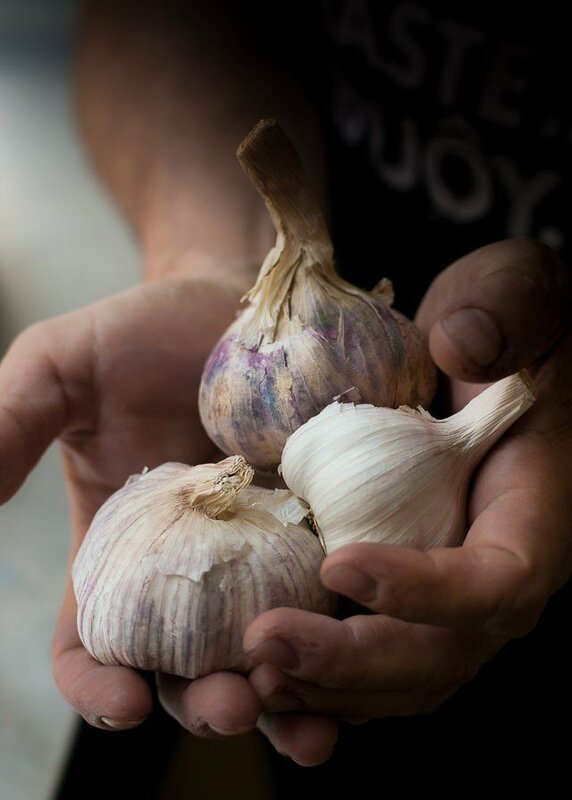 I do the same with the garlic, though for a bit longer (30 sec) to reduce some of that raw garlic taste. It does take a bit more time though to dry the basil, but it makes for great taste and color. If I remember correctly, I got the tip from a NYT article Thomas Keller wrote many moons ago when he was the guest chef in a weekly column in the NYT’s food section. Made basil pesto tonight with mom’s yummy basil, raw almonds and walnuts, olive oil, roasted garlic, and fresh grated pecorino romano. My parents, my neighbor and I slathered it all our grilled pizza, on fresh dough crusts with goat cheese, and we where dipping some farm fresh colby in it. Great photos and I love the initiative to eat pesto daily. Maybe it’ll be my July (mid-year) resolution, that is, if there is such a thing. I love pesto! We are so lucky in the Kansas City area to have an abundance (at a price) of fresh basil year round, thanks to Cal-Ann. It flies off the produce department shelves. And the plants are so good that when most of the leaves are pinched you can set the plant in your summer garden and get even more great basil. YUM! i LOVE pesto to!! just made a cilantro/basil with toasted pumpkin seeds (great nutritional value), sesame seeds garlic, ginger, olive oil, a drizzle of toasted sesame oil, lemon juice, salt, and pepper…. so simple and so tasty!! enjoy! There are an awful lot of good comments here but I’ll add another brief one: freeze pesto in ice cube trays then you always have a couple of tablespoons at the ready to add to a sauce, soup or stew….might help to safeguard your promise for days when basil is hard o come by. Does anyone have Lynne Rossetto Kasper’s book “The Italian Country Table” ? Excellent recipe for Pistachio-Almond Pesto, made with mint. It gets rave reviews every time. 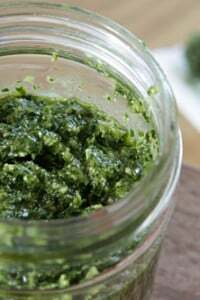 Just a note if you process 4 parts basil to 1 part baby spinach, when you freeze your pesto it will retain a very vibrant green color without affecting the taste. David, I thought of you last night as i was drizzling some artichoke hearts with pesto – delicious! I also made a batch recently and have decided that so far my favourite is simply drizzling it (generously) over big juicy tomato wedges. You always have such timely posts! Dana, I’m glad you mentioned the ice cube tray thing. I was afraid to, among so many purists. (no food processor?!) I used to make basil cubes, but this year I tried something new and found it has advantages. 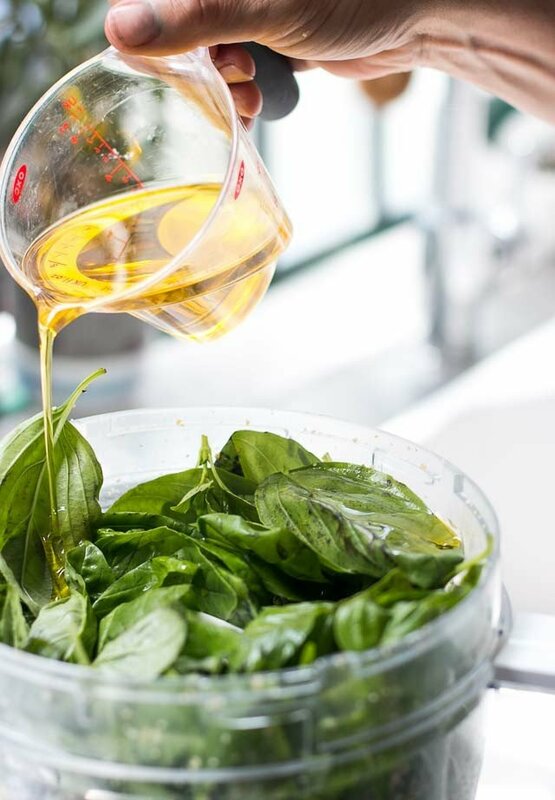 I blend the basil with oil, or make pesto and then scoop a cupful into a quart sized freezer bag. I then flatten out the contents, gently squeezing out all of the air. The flat sheets are easier to store and it’s easy to break off a chunk, large or small. I also don’t stain my ice cube trays anymore. Seriously david, no food processor? I’m looking at my Cuisinart and wondering if I could do it. I just made an unconventional pesto starring not garlic (nor basil for that matter), but garlic scapes from my local market! 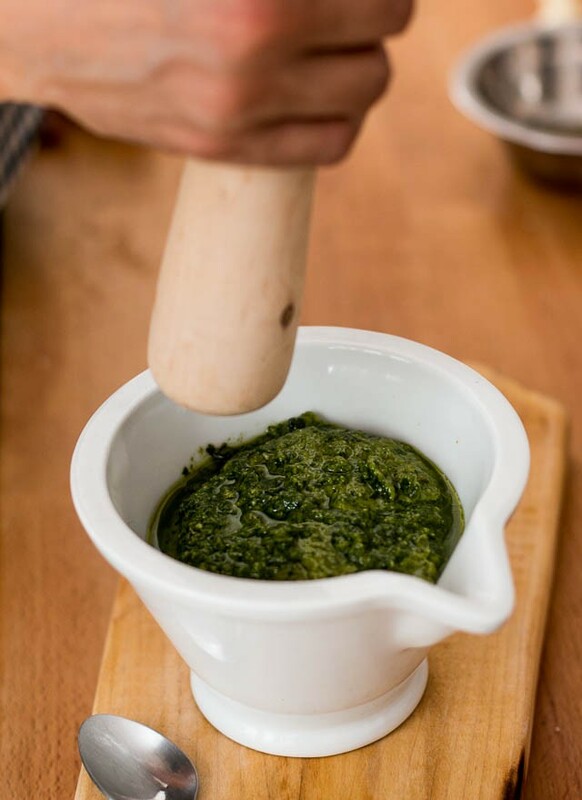 Pesto made with mortar/pestle! I’m working my way slowly through the Chez Panisse Vegetables cookbook (not really scintillating reading, but I am trying to retrain my attempts to cook tasty vegetables.) Anyway, I made the absolute best pesto ever using the mortar/pestle recipe. I did use the processor to “re-size” the basil leaves to about 1/2″ pieces – my mortar/pestle is fairly small. As a Genovese pur sang I love my pesto with raw nuts (both pinenuts and walnuts, the latter in smaller quantity) and with both Parmigiano an pecorino cheese though it’s nice to vary from time to time. 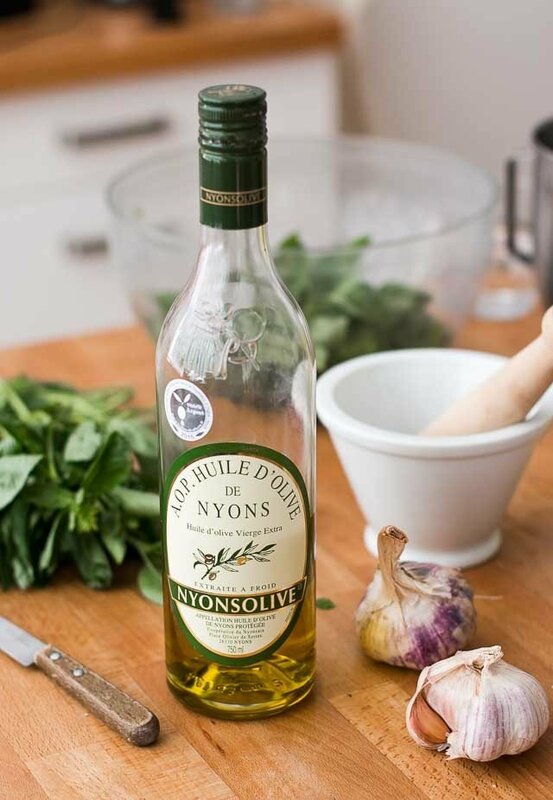 I usually use the “nutless” version as a salad dressing since I find it more suitable for such a light dish while I think the nutty one is more suitable for my pasta recipes. And I sadly admit that I completely lost my pestle-and-mortar habit to an easier kitchen mixer one. ;) Ciao! I believe the pine nuts may be substituted with walnuts. I dont get any pine nuts where I live. Pesto was one of my kids’ first foods, despite the pediatrician’s admonitions to the contrary. When my older daughter was about 21/2 we were traveling through rural Pennsylvania and she ordered pasta with pesto at an Italian restaurant. The waitress refused to serve it to her, insisting that kids don’t like “green stuff”. I assured her that my daughter was an experienced pesto eater, but she was having none of that. I finally ordered the pasta with pesto for myself, ordered what I wanted for my daughter, then swapped the plates. I grow several varieties, including Thai, which is wonderfully different tasting. Now, I’m going to have to go and get myself a mortar and pestle. Silly me- I was whacking away with a knife all that time! Happy Bastille Day, and keep scoopin’! Like others, I was going to say Parisians need to grow their own basil! When I lived in a unit I grew it on the balcony successfully in pots. Interestingly, David, you use a lot less oil than I do, my recipe is similar but I use between 1/2 to 1 cup of oil. I found that if you add the oil very slowly (say pouring continuously for over 2 minutes), you get a much thinner pesto than if you just pour it all in and give it a good bash. So, as I still have a bit of basil growing (well surviving) in the front yard (and it is winter so I am happy it has survived this long) I’ll have to give your amounts a whirl. I’ll just have to quickly get over my craving for rocket based pesto beforehand. I have to admit I’m very happy with the results I get with my ancient Oster blender. Once you have blended the oil, nuts, salt, then start adding the basil. Pulse, stop, shove it back down in the blades with a butter knife, repeat. When it’s all coarsely chopped, then set the blender to run steadily, and with nerves of steel and the top off, run the tip of the knife (the tip only, don’t go very deep or the blade will be hit) around the inside edge next to the glass. Doing this allows all the basil to get down into the blades and get ground up really finely.Liquified, as one of the many buttons says. I don’t worry about drying the basil, because you need a little moisture for this to work. Then stir in the cheese, and I say, try half pecorino and half parmesan. Flavors are often brightened with acid–that’s what the pecorino does. Fine Cooking ran a piece a few years ago about a chef who blanches the pesto first to try to retain the greenness. I did not like the results of this at all, but in my own quest for greenness, I went back to raw basil and tried adding a bit of lemon juice, much like the poster who used vitamin C. Lemon juice keeps it green, and again, the acid note is just right, especially along with the pecorino. It doesn’t really taste like lemon, it just tastes good. When the pasta is almost done, thin it out in the blender with some starchy pasta water–thinner than you think and then it stays loose on the pasta which tends to soak it up. The boiling water helps melt the cheese, and maybe it’s a bit like blanching the basil, because it does stay green longer. Growing basil from seed is so easy. Johnny’s Seeds in Maine sells the Genovese type and has great service. Direct seed it thickly, cover with thin layer of peat, then thin it out, eating the thinnings until you like the plant spacing. Once it has a little size on it, clip any top that threatens to flower and eat that. You’ll have a nice little basil hedge that lasts until frost. How nice to discover your blog from watching Diary of a Foodie on Sat. I heard you on Jean Feraca’s radio food show once, and enjoyed the conversation very much. And of course, your books are great. Beautiful pesto! And how much does that mortal and pestle you want weigh?! I have loved reading this blog. I’m going to deffinately try the peso salad dressing and freezing the pesto in gallon freezer bags. Does anyone marinated some type of meat in pesto and then freeze the meat in pesto marrinade for later use? Would that be too strong a flavor for the meet after 3 weeks of being frozen? I’m always trying to do things ahead for when all the kids descend on the holidays and it is so hectic. I have the best pesto, tofu, spinach lasagna from the eat right for your blood type cookbook. It is absolutely delicious and great for your vegetarian friends. And by the way it is “highly beneficial for all blood types” according to the author. I combine a lb of soft tofu, a package of frozen or fresh chopped spinach, 1 egg, 1 cup mozzarella cheese and a teaspoon salt and oregano. You layer lasagna noodles, this tofu mixture and then a layer of pesto on top of the tofu mixture. I probably use 3/4 of a cup at each layer. Then noodles and repeat finishing with mozzarella and parmesan cheese. Bake at 350 for 45 minutes. I serve it with Tri tip and a big salad that way when some of the guest are vegetarian they have something. It is a great potluck dish as well. My son’s college sports team descended one evening for a barbeque and I served a few of these lasagnas as side dishes and every one raved. I have made spinach pesto. Scratch the Garlic and add lemon zest. The other ingredients are the same. Great anytime of year. Great on chicken. shrimp, pasta. Pesto makes everything delicious, I agree. Last fall after braising a bottom round roast, steamed potatoes (fingerlings), green beans and pearl onions, I fanned slices of the meat, etc. on a platter and drizzled my pesto over all. It was gone in no time and my husband turned to me and said ‘I could eat this everyday…’ The tender flavorful beef was like candy with a touch of pesto. Also, I made a sort of torte/polenta. Alternating layers of polenta and fresh mozzarella and pesto. It was sublime. You must try pesto as a dip for calamari. Ahh-mazing! This recipe is great. I spent a semester abroad in Italy in 2009 and ever since I got back it’s been almost all Italian in my kitchen with my mom all the time. Pesto is one of those one’s we’ve wanted to try but have never branched into producing (we’re even making beer now so we need to step it up). We have started growing our own basil so I think it will not be too long now before I am pounding it all together. Can’t wait to try it.